John Chester, VI Learning Coordinator, shares some ideas about the introduction of braille to children with additional needs. Access, understanding and use of the written word, both in terms of reading and writing, can be an enormous enabler to any child’s educational progress. Every child, with or without a disability, begins with no ability in this area, and their capacity to acquire skills will be an individual journey, never more so than when considering a child who has a vision impairment and additional needs. It’s often perceived that braille is difficult to learn; reading and writing braille both hold their own challenges. I’m aware of children who have been introduced to braille and have far exceeded expectations in terms of how much of the code they have mastered, speed of reading, and writing and levels of comprehension. For other children, braille can prove too complex, in which case, of course, another medium would be considered. Ultimately, decisions about the appropriate learning medium are individual, and should be based on assessment by a Qualified Teacher of children with Vision Impairment (QTVI). I’ve worked with many students who have additional learning needs. RNIB statistics indicate that 50 per cent of young people with vision impairment (VI) have additional disabilities. When students have learning difficulties or learning disabilities, they may need more support or more time to learn the braille code and to move on to understand, retain and apply the various rules of contracted braille. What are we teaching and why are we teaching it? It’s important to consider why braille is being learnt and maintain a practical focus on target-setting. A basic ability to read braille will give a child a degree of access to learning and independence, even if they do not progress to high levels of literacy or fluency. If a child can recognise their own name in braille, or even the first letter of their name, they may be able to identify belongings, a peg in a cloakroom or their own drawer. It’s important to maintain aspirational expectations of learning ability, but also celebrate the practical application of levels achieved along the way. 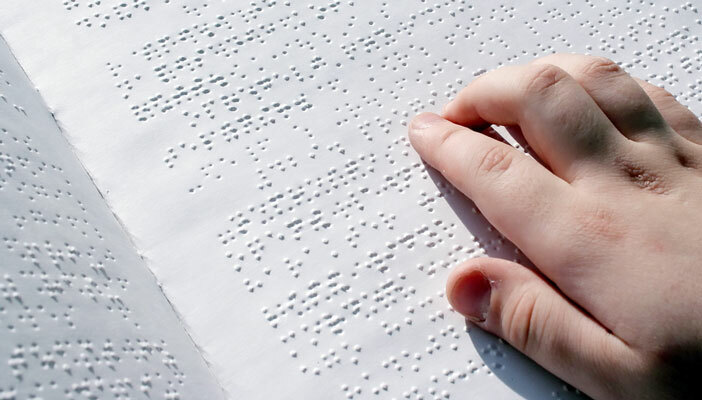 Braille is a symbolic system where a particular tactile pattern has a particular meaning. Sighted children are taught that a particularly shaped line (a letter) has a particular sound, and that a combination of letters is a word that has a particular sound and meaning. For a child to understand braille, they must first understand that objects that they can touch, have specific features, and those specific features can then have meaning. Before a child moves on to a symbolic system, they need to be able to understand that things they touch have distinct features. They may then move on to develop an understanding that an object might have a meaning. Objects of Reference are often used with children with VI and additional complex needs, to this effect, to introduce the fact that an object can be used as a symbol and has a meaning. An object, for example a piece of towel, might be used to denote to a child that they are going swimming. A different object, such as a spoon, might be used to denote that it is a mealtime. If a child has developed an ability to discriminate between objects using touch, and has moved towards an understanding that objects can be used to represent meaning, it may be that braille is considered as a next step in their learning. As for all children learning braille, the learning pathway would support the development of pre-braille skills, to further develop the ability to learn using touch, before moving to individual braille cells, then in combination before moving to contracted braille. A child learning through braille, may reach a point where they are required to navigate braille presented in diagrams, tables or charts. Everyday braille ability may be quite good, but when additional navigation is required, some particular support may be useful. If a child has particular additional needs which affect their spatial awareness, understanding different layouts (especially in Maths) and diagrams can be a challenge. The student may find it difficult to locate a specific point and then track along to find a label. The use of Bumpons, tacks and cork-boards, and pins may be a low-tech solution, moving along a line and finding a specific point. Repetition is key. Sometimes the skills needed to access complex diagrams may be out of reach, in which case different ways of presenting the information should be considered. However, it’s important to continue to, plan, do, review and repeat this cycle – setting realistic targets. Consider the additional support needs that a child might have. For example, do you need to present braille in a way that takes account of any physical disabilities? Are you giving enough time to allow for processing difficulties? Memory aids – crib sheets to check when reading texts with new signs. Realistic target setting – why is the student learning braille? Do they need to learn all contractions to enjoy reading and access texts in their lessons? Braille can be graduated between uncontracted and contracted (learning tables), and uncontracted braille alone can still be used to access written text. If the student struggles to recall a contraction, encourage them fall-back and use uncontracted braille, this means they can keep up with the class when recording their work. Alternatively, promote the use of short-forms as a shortcut – take the word necessary (often misspelt), in contracted braille it is simply “Nec”. This is much easier. Work alongside a literacy tutor or English teacher to transcribe spelling booklets and resources to support learning. Most importantly – repetition. Provide student the time to practice braille skills repeatedly in planned tutorials. Don’t forget that braille is a code to enable literacy and should always be considered in terms of what the child can learn and achieve through their braille ability. As discussed in one of my previous articles, I often embed literacy into my teaching and planning. VIEW and NatSIP offer The effective teaching of literacy through braille certificate for education professionals. This course was developed as the importance of embedding literacy into a braille curriculum, or vice-versa, is clearly of paramount importance. Whatever the learner’s level of vision impairment and whether or not they have additional needs, it’s important to consider and strive to reach meaningful use of a medium to access the world. The UK Learning Media Assessment is available to professionals via VIEW (subscription required) and should be used by TVIs and QTVIs alongside the “team around the child”, to make “informed, transparent and data driven decisions” about the learning literacy media. This assessment factors in all relevant data and allows a careful decision to be made which for some will help decide if braille is a realistic medium for learning or not.